In this lesson, we will learn how to distinguish between systematic, self-selected, convenience, and stratified sampling and how to determine whether a sample is biased or unbiased. Which of the following data sets would be suitable to determine the total percentage of absences in a school? Three different toys are stored in a warehouse. There are 15 000 toys in total and the number of each is shown in the table. A stratified sample of all the toys is taken and 420 cars are selected. 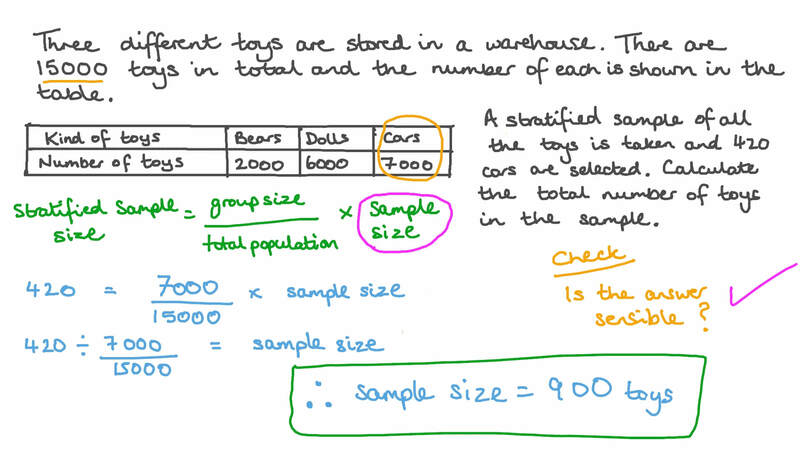 Calculate the total number of toys in the sample. A school principal was happy to announce that the number of late arrivals per day in the whole school was only five on average. Is this figure a sample statistic or a population characteristic? Which of the following choices would define a random experiment? A It is an experiment or a process for which the outcome can be predicted with certainty. B It is an experiment or a process for which the outcome cannot be predicted with certainty. Which of the following is an outcome of a random experiment? A school principal wants to find out what the students think about the teaching quality in the school. Which of these samples is unbiased? AA list of students to interview is randomly generated. BA list of male students to interview is randomly generated. CA questionnaire is available at the library for anyone who wants to take part in the survey. DA list of female students to interview is randomly generated. EAll ninth grade students are interviewed. An experiment has been designed to investigate the alleged benefits of using a fabric softener. In the experiment the participants are divided into two groups: one group gets laundry washed using a fabric softener, while the other gets laundry washed without using any fabric softener. All of the participants laundry is washed over several weeks and none of the participants know how their laundry has been washed. Which of the following is the type of the experiment? Which of the following is the treatment variable? There are about 15 million registered voters in a state, and the government wants to know what proportion of them intends to vote in the next general election. In a survey of 1 0 0 0 registered voters, 648 responded that they did intend to vote. Which of the following is the population parameter? An animal rescue center wants to find out if people in its town think more money should be spent on animal welfare. They plan to ask a random sample of their visitors and volunteers to fill in a questionnaire. Why would their sample not be representative of the town’s population? AThe center’s visitors and volunteers are likely to be supportive of spending on animal welfare. BPeople will not want to spend time filling in the questionnaire. CThere might be a high proportion of children in the sample, which will skew the result. DWe do not know how they will ensure that the sample is random. Farida wants 5 random numbers from 1 to 5, so she spins the spinner 5 times. Her results are 3, 3, 5, 1, 3. Which of the following statements about her results is true? AThey are random numbers because the spinner is fair. BThey are random numbers because their mean is the same as the mean of the numbers on the spinner. CThey are not random numbers because there are no even numbers. DThey are not random numbers because there are too many threes. A drug company conducted a trial to find out if females aged 25–40 experienced an improvement in their migraine symptoms if they took a new drug. The people in the trial found that the number of migraines they experienced was halved. Which of the following inferences would the company make from their results? AThe drug halves the number of migraines in females. BThe drug halves the number of migraines in females between the ages of 25 and 40. CThe drug halves the number of migraines in people between the ages of 25 and 40. A pharmaceutical company wants to find out if a new drug can delay the formation of white hair. They decide to carry out an experiment using a placebo. Which of the following is the treatment variable in this experiment? Many variables need to be controlled in order to make the experiment results valid. Which of the following variables does not need to be controlled? A teacher wanted the children in her class to have a random sample of coins for a lesson. She put nickels, quarters, and dimes into a bag, and the bag was passed around the class for each child to select a coin without looking in the bag. Why is this unlikely to produce a random sample of coins? AThe students might look in the bag and choose a coin that they have seen, so they will not be selecting the coin at random. B The students might be able to identify the coins by feeling their size and weight, so they will not be selecting the coin at random. A student wants to research the amount of pocket money students in his middle school receive. Which of the following would be the best way to get a representative sample of the population? Which of the following is a representative sample? ATo find out how students travel to school, student representatives from each grade ask a random sample of 20 students from across their grade. BA hospital wants to investigate the reasons why people go to the emergency room, so questionnaires are handed out to a random sample of people waiting in the emergency room on a Monday morning. CA student wants to find out how much students at their school enjoy math classes, so they give a questionnaire to everyone at the math club. DA market research company wants to find out how much waste people recycle, so they survey 100 people at the city recycling drop-off location. In probability, what is an experiment defined as? A teacher wanted the children in her class to have a random sample of coins for a lesson. She put nickels, quarters, and dimes into a bag and passed it around the class for each child to select a coin without looking inside. Why is this unlikely to produce a random sample of coins? BThe students might be able to identify the coins by feeling their size and weight, so they will not be selecting the coin at random. CThe bag might be transparent, so the students will see the coins and will not be selecting the coin at random. A fair coin is thrown randomly four times; it lands on heads every time. AThe coin will land on heads next time because it lands on heads every time. BThe coin could land on heads or tails next time it is thrown because it is not affected by what has happened previously. CThe coin will land on tails next time because it has landed on heads so many times. Is tossing a coin an experiment? Is choosing a marble from a jar an experiment? A bag contains a total of 12 marbles; 4 are green and the rest are yellow. Mariam randomly takes a marble from the bag, records its color, and does not replace it. She then repeats this process a second time. She draws the following tree diagram. Write the values of the probabilities , , , and in the probability tree. Give your answers as unsimplified fractions. Calculate the probability of choosing two marbles that are of the same color. Give your answer as a simplified fraction. Calculate the probability of choosing one marble of each color. Give your answer as a simplified fraction.